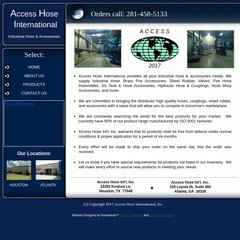 www.Accesshoseintl.com - Access Hose Int'l Inc. It is hosted by Ntt America Inc (Colorado, Centennial,) using Microsoft-IIS/7 web server. Accesshoseintl.com's server IP number is 209.157.71.123. There are 3 Nameservers, ns3.mdnsservice.com, ns2.mdnsservice.com, and ns1.mdnsservice.com. PING websites078.homestead.com (209.157.71.123) 56(84) bytes of data.